When it comes to whale watching destinations, the Arctic isn’t always the first place that springs to mind. However, a total of 17 different types of whales inhabit the waters and three whale species live there year round. Those three species are some of the rarest: beluga, bowhead whales and narwhal. The elusive narwhal is one of the most sought after whale species to see in the Arctic. Narwhal live there year round generally above 61 degrees North and have never successfully been kept in captivity. The only way to see them is in the wild. They are often called the “unicorn of the sea” because of their iconic tusk. The Canadian Arctic is home to an estimated 80,000 narwhal accounting for 75% of the world population. The best time of year to see narwhal is spring and summer. In May and June narwhal can be seen at the floe edge of Lancaster Sound, at the northern reaches of Baffin Island, Nunavut, during the annual migration to their summer feeding grounds. Travellers can get rare opportunities to view narwhal up close from the sea ice in their presence. Beluga are one of the most recognisable and popular whales because of their white colour, “smiling” mouth and comical demeanor. A smaller species of whale, beluga are social mammals often seen in pods. They live in Arctic an subarctic waters, especially the Canadian Arctic. An estimated 2/3rds of the worlds population of beluga (approximately 150,000) summer in the Canadian waters. They have adapted to the sea ice by evolving without a dorsal fin. The sea ice is important for beluga’s food web as well as protection from predatory killer whales. This makes the floe edge an excellent place to spot pods of beluga. As they migrate south, the summer months offer great opportunities to encounter beluga. You can get a chance to view them in July and August in and around Cumberland Sound. Giant bowhead whales live year round in the Arctic. They have an average size of 15 – 18 metres but have been reported up to 20 metres and can weigh up to 100 tonnes. Bowhead are known for their massive bow shaped head that make up one third of their total length. They use it to break through the ice as thick as 60 cm. Like narwhal and beluga, bowheads also lack a dorsal fin , helping them navigate their icy environment. Approximately 90% of the estimated 200,000 bowhead whales spend their summers in Canadian waters. In the summer they inhabit waters throughout Davis Strait, Baffin Bay, Lancaster Sound and the channels and fjiords of the Arctic Archipelago, Hudson Strait, Foxe Basin and northwest Hudson Bay. In May and June you can get the chance to see them at the floe edge of Lancaster Sound whilst in July and August they can be seen in Cumberland Sound and in August you can also get the chance to see them at a Bowhead Molting location where operators return each year in hopes of witnessing molting behaviour. Contact Nim Singh, Media and PR Manager, Destination Canada on 0207 389 9983 singh.nim@destinationcanada.com for more information. Known as the Unicorn of the Seas, it is no wonder that travellers often ask if they are endangered. They have never been succesfully kept in captivity and the only way to see them is in the wild. 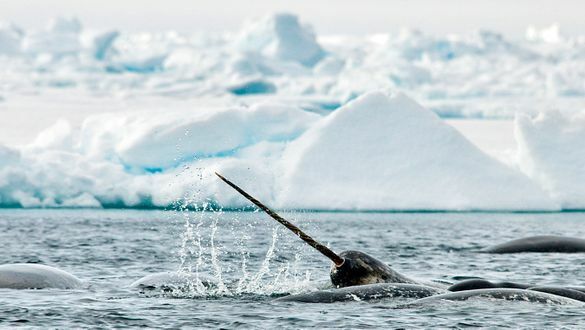 You can spot Narwhal at the northern reaches of Baffin Island, Nunavut, during the annual migration to their summer feeding grounds in May and June. It is even more thrilling to see them in pods of up to 50 – 100! Plus at this time of year, you can see them under the soft glow of the Midnight Sun. In Canada the narwhal are identified as “Special concern” by the Committee on the Status of Endangered Wildlife in Canada (COSEWIC). This indicates a species that may become threatened or endangered because of a combination of biological characteristics and identified threats. One of the main threats is the rapid climate change in the Canadian Arctic. With decreases in natural ice cover and thickness this is one of the main reasons the Narwhal are endangered. Unlike some species of whales that migrate, narwhals spend their lives in the Arctic waters of Canada, Greenland, Norway and Russia. The average life span of the narwhal is 30 – 40 years but many have reportedly lived beyond that, up to 50 years old! Tusks can grow as long as 10 ft. The elongated tooth grows into a long spiralled tusk which can grow up to 10Ft. It is most commonly recognized as the left protrusion but occasionally a right tusk develops too, giving some narwhal two tusks! This whale species are one of the deepest diving marine mammals. They can dive as deep as 1500 M , lasting around 25 minutes under water. Narwhal can spend more than three hours a day underwater below 800 M depths. Like other Arctic whales including bowhead and beluga, narwhals don’t have a dorsal fin. The absence of a dorsal fin allows narwhal and other Arctic whales to prevent heat loss, reducing surface area, and allows them to swim under sheets of ice.